Bask in the love our campers give us! The following are some of the comments made by our lovely campers following their East Sussex camping stay at The Secret Campsite Beech Estate (formerly known as Eco Camp UK’s Beech Estate Woodland Campsite). 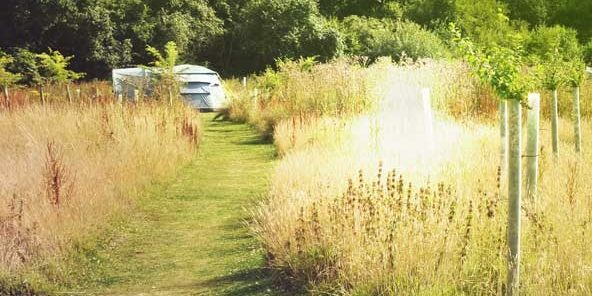 If you like what you read we hope to will come and join us on an East Sussex camping adventure soon – even if you are not an experienced camper you can try our ‘wild glamping’ form of Sussex camping experience! Click on these links if you would like to read what our campers are saying about The Secret Campsite Wild Boar Wood or The Secret Campsite Lewes. After three nights this week at the Beech estate I just want to come back for more; and with only a few other people on site, I felt as if I had the place to myself. Imagine that, my very own forest !? The variety of wildlife on the estate is quite amazing and made itself known 24 hours a day. So every opportunity was taken to brush up on flora and fauna i.d. from sound, sight and track or even just to lie back in the hammock after a fire-cooked dinner and listen to the symphony being played out all around. Thank you to the atmospheric Owl, serenading Robin, alarming Woodpecker, chatty Magpie, hysterical Blackbird, careful Deer, playful Wren, vocal Fox, and the meandering Buzzard. Oh and thank you wardens, for looking after the pitches and what little admin was required to produce a happy camper. We loved our camping weekend. And we love your campsite. It was our second visit and it was better than I remembered. It’s one of my favourites if not my favourite site in Sussex. No criticisms at all. We loved the bucket showers – the kids thought they were great fun. We loved the bluebells and the perfect spot you chose for me on plot F5. My son and I remember the visiting birds such as the pheasants and song birds that we enjoyed waking up to each morning. The campfire with fire wood was great to have available and was my son’s first experience of a campfire. We had a lot of firsts in those couple of nights such as camping in a tent and open air showers, brilliant! Thank you so much for all your help and for making this the best son dad experience I’ve had and with father’s day coming up I am reminded that I have a lot to be thankful for. Thank you so much for allowing us to stay at the Beech estate, it has been the best campsite we have ever visited. The pitch (F1) was perfect for our needs and our two children really enjoyed it too. The warden was wonderful and extremely informative. I spent 2 nights at your camp with my teenage son, we had pitch W7 which couldn’t have been more perfect. Fab camp, great few days and loved the walk to the pub. Wasn’t sure what to expect from the bucket showers but found these simple and effective and a great way to focus the mind on how much water we use. We had a great time on our second visit. The warden was a perfect host, friendly and helpful….We didn’t use the bucket showers last time, but we tried them out and they were perfectly good. The recycling is a new addition since our last visit, which was helpful. Everything else was great really, can’t complain. We will definitely be back again in the future to our little piece of the woods. We had a brilliant time and the kids loved it – we’ll definitely be back. It was our first time camping and it couldn’t have been better. We had a great weekend, helped a little by the fantastic weather. It was our first time at Beech Estate and I hope and expect we’ll be back soon. It was a last minute job, but we ended up with a lovely spot. Is it possible to pre-book a specific pitch? Everything was great – the amount of space for each pitch, the seclusion, the woods and the wildlife. The wardens obviously take a lot of care of the place, and the loos/showers were maintained very well during what must have been a very busy weekend. We’ve just spent a scorching weekend at Beech Estate and wanted to pass on just how brilliant the warden was. We had huge dramas with broken down cars, RAC lorries, taxis, abandoned families with no lunch and phones without charge so needing a personal messages service – and he was amazing! Really calm, so helpful and above and beyond on every level. What a star! Please pass on my family’s thanks to him – and we hope to see him next year in person to do the same. My wife Leticia and me spent a wonderful bank holiday weekend at your sight, We loved everything. The forest pitch was perfect for what we wanted. Really quiet and secluded, we felt like we were alone in the woods. We loved the bucket showers, the helpful wheelbarrows and felt very well supported by the staff. Also we had a great time doing the red hike and doing a day trip to Hastings. Overall we will definitely come back for more.